Xcavator.net is a stock photo search portal based on visual search technology. Xcavator.net provides natural and intuitive interactive search for stock photography providing buyers with a browsing experience based on both visual content and keywords. The key to the visual search capabilities is the portal’s color and image search engines, powered by CogniSign Intelligent Image Recognition Technology. In laymen’s terms, Xcavator.net offers three types of interrelated search options. Tradition search delivers photos based on tagged keywords and is much the same as others in the stock photography market. 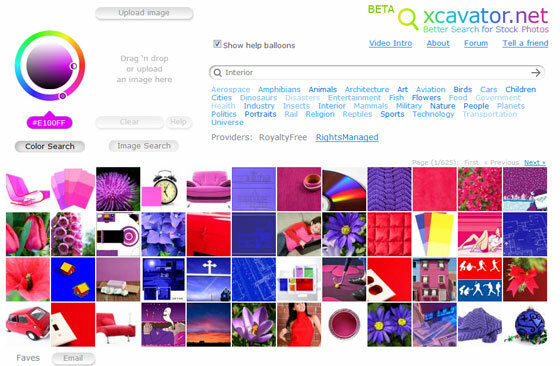 Where Xcavator.net gets interesting is in color and image search. Xcavator.net allows color search matching, for example if a stock photograph was needed that matched a brochure or web site in terms of colors, users are able to refine the photo search to those colors by utilizing a color chart or by inserting the exact hexadecimal color into a box. Image search provides similar photos based on a user uploaded image or via a drag and drop of images found in an initial search. Xcavator.net competes with other visual search sites including Riya, Pixsy and PicSearch. Xcavator isn’t necessarily better than any of their competitors, but different. The color and related search capabilities don’t have the same level of user enjoyment as Riya’s search features do, yet Xcavator.net’s features feel more practical and are definitely more finely targeted at niche stock photo search. Xcavator.net recently signed a deal with iStockphoto that delivers 1.8 Million images from 38,000 contributors into the Xcavator.net search database. The site comes out of Beta on July 2.